Every flower is a soul blossoming in nature.” These words by the French poet Gérard de Nerval talk of the beauty of a flower, beauty it extends to our lives. Flowers also make for great beauty ingredients. Their extracts, being rich in vitamins and antioxidants, help cleanse, moisturise, and nourish the skin, and their healing properties can fix a host of skin concerns. Rose water, for instance, is a go-to choice for many as a toner and a mainstay in face packs, report Hindustan Times. With help from beauty experts Richa Aggarwal and Mallika Gambhir, we take you on a floral journey extending beyond the quintessential rose, sharing recipes of natural face packs and scrubs for a more radiant you. However, remember to do a patch test first to be sure that natural allergens present in flowers don’t irritate your skin. These have the power to even out your skin tone give you and a radiant complexion. Hibiscus and geranium are excellent for detanning, soothing the skin, and tackling the issue of pimples effectively. Mix some hibiscus and geranium petals, add aloe vera juice to it and apply on the skin. Or, take hibiscus flower powder, ½ tsp multani mitti powder, ½ tsp honey and a little yoghurt. Mix well into a soft paste. Apply on face for 15 minutes to lighten tan, soften skin and add a natural glow. If the flower is not available, you can even use its seeds to avail its benefits. Soak sunflower seeds in milk overnight, grind them to form a thick paste, mix some watermelon juice or rose water to have a consistency that makes it easier to apply. Wash off after 15 minutes and enjoy its soothing benefits. 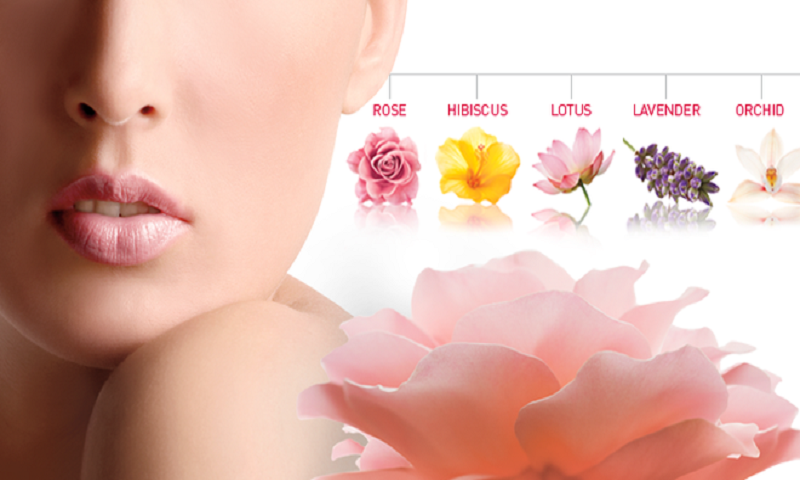 Lotus contains linoleic acid and other skin brightening minerals. It is gentle on sensitive skin, an effective exfoliant and wonder ingredient for a nourishing face pack to improve skin texture. Prepare a paste of crushed lotus flowers, boil them and use this water in a pack made using besan or oats (avoid besan if you have dry skin), massage gently and rinse with cold water. The stem of lotus is also good for consumption. Known to be rich in vitamin C, it helps in collagen production, enhances elasticity of skin and keeps blemishes at bay. It also offers potassium, which helps regulate blood pressure. Take a few crushed jasmine petals, add chilled yoghurt and aloe vera juice to prepare a face pack for skin brightening and toning. Lactic acid in yoghurt has anti ageing and anti tanning properties. This lovely yellow flower has the ability to clear blemishes and reduce tanning. Rich with antibacterial and anti inflammatory properties, it is an antiseptic and excellent astringent, so its extract is helpful in brightening and moisturising the skin. Crush a few marigold petals, mix with raw milk/milk powder, and soak overnight in a glass bowl. Apply in the morning to clean your face with this, rinsing off with cold water. A popular botanical skin care ingredient, rose has moisturising, astringent and antiseptic properties. Its extract can help minimise stretch marks, scars and wrinkles. To brighten skin, make a smooth paste of 10 fresh rose petals, 1tsp honey, 1 tsp pure sandalwood paste, 1 tsp raw milk and a 8-9 strands of saffron. Apply on face and wash after 15 minutes. To get rid of the dead cells, oil and grime that blocks the pores on the face, make a paste of 10 rose petals, crushed oats, 1/2 tbs orange peel powder, and orange juice. Leave on face for 15 min, and rub off by massaging in a circular motion using the fingers.